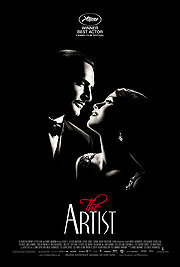 The artist is yet another one of those films that dabbles in black and white and tries pushing the envelope even further back into Hollywood’s history. I still remember back in 1993 when Spielberg was supposedly taking a chance with black and white, with worries of audience used to color not accepting it. Oh how far we’ve gone. With things like the Cohens’ ‘The Man Who Wasn’t there’ and Clooney’s ‘Good Night, and Good Luck’ it seems like black and white isn’t so unusual anymore. Now they’re going to great lengths to emulate the style. Soderberg’s ‘The Good German’ dabbles in ‘40s lenses and microphones, but it still doesn’t feel quite authentic enough. Now we have The Artist, that goes back even more, back to the silent era. Its star is a kind of Douglas Fairbanks, that much like Fairbanks was also hit by the advent of the talkies (albeit, as the ending shows, for different reasons). The style, I would say, is even more impeccable when compared to the originals. Michel Hazanavicius went as far as shooting in 1:33 aspect ratio, with a 22 fps frame-rate for that sped-up effect, and with intertitles instead of dialogue. It’s not all in the technical details though. The acting and plot also follow traditional silent-film melodrama fare. There is even the hero dog that saves the protagonist from a fire. It’s maybe ironic that we had to wait this long for technology and style to advance enough for us to be able to emulate the low-tech style of the late ‘20s/early ‘30s. Style aside, however, this works very well as a fun walk down Hollywood’s own memory lane. A lot of the references might be lost on non-film-history-buffs, but I think it stands enough on its own to be enjoyed even by the average movie goer (if they were somehow convinced to attend a silent movie). Overall great fun, and not just for the retro-qualities.